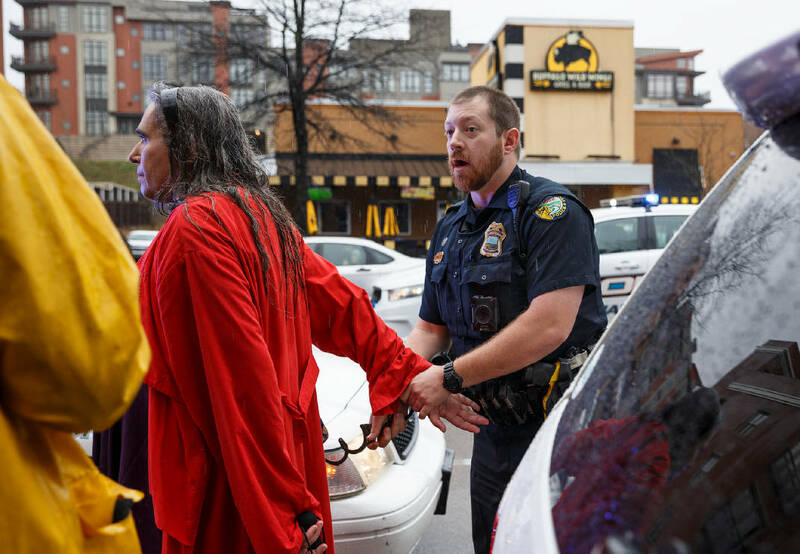 Staff photo by Doug Strickland / Demonstrator Maddie Nix, identified by police as William Nix, is arrested during the Chattanooga Women's March on Saturday, Jan. 19, 2019, in Chattanooga, Tenn. At least four demonstrators were arrested during the march after walking in Market Street and ignoring police orders to move to the sidewalk. A tense women's march in Chattanooga led to five arrests after activists blocked city streets without a permit and refused to move. Marchers walked across Chief John Ross Bridge where several police officers ordered them to move, another vehicle charged at them, and organizers chanted and cursed through megaphones before ultimately being taken into police custody. The group did not have a city permit because they did not want to pay the required cost for police to come to the event, according to an event organizer. The Chattanooga 2019 Women's March Rally began with about 200 supporters huddled under Walnut Street Bridge to shelter from heavy rain. They listened to speakers before a group of 75 or more elected to march into the city. A portion of the group blocked Frazier Avenue before a police cruiser arrived and many stepped back onto the sidewalk. However, about 20 in the march remained on the street, blocking traffic as they crossed Chief John Ross Bridge onto Market Street. Officers used loudspeakers to tell marchers to get onto the sidewalk at least a dozen times as traffic backed up across the bridge. As they crossed the bridge, a civilian caught in the delay charged their vehicle at the marchers through the heavy rain after a police cruiser had pulled away from the scene. The driver slammed on their brakes at the last moment, barely missing the protestors, and honked and revved their engine. An officer came to the vehicle and told the driver to turn around. The driver did not turn around but retreated and followed the march from a distance. The officer who spoke with the driver went back to tend to the marchers and believed the driver had followed instructions to turn around and leave, he later told a police department spokesperson. They were not arrested because the officer told them to leave and believed that they had followed the instruction. "There was a driver who was obviously upset about them blocking the road and gave signs [such as] revving their engine and thrusting forward," according to a police department spokeswoman. "Officer were able to intercept [the driver] and prevent a possible tragedy including injury or even death to pedestrians." Other officers blocked the end of the bridge, ordering marchers onto the sidewalk. However, they walked around and onto Market Street near the Tennessee Aquarium. Five were arrested after they continued to march, ignored police orders and chanted "these are our streets" from a megaphone. The rest of the group used the sidewalks to travel back to Coolidge Park. March leader the Rev. Alaina Cobb gave an impassioned speech as she was placed into handcuffs on Market Street. "It is our duty to fight for our freedom," she yelled. "It is our duty to win. We must love and support each other. We have nothing to lose but our chains." She was then placed into the back of a police vehicle. Closer to the bridge, Virginia "Ginger" Moss was also being arrested. "I'd like to say that I have been exercising my freedom of assembly and my first amendment rights," she shouted to a Times Free Press reporter as an officer handcuffed her and placed her in the back of a police vehicle. "We own these streets, and every time protestors are arrested, it is thrown out of court, and the police get chastised for doing it." Maddie Nix, identified by police as William Nix, Joel Willis and Holly Lynn Selvwv, identified by police as Holly Johnson, were also arrested. All five were charged for obstructing the roadway. "The Chattanooga Police Department supports community members who stand for things they care about, but it needs to be done in a way that does not pose a significant safety risk to the participants and others in and traveling through the area" according to a statement from Chief David Roddy. " March chairwoman Jean-Marie Lawrence was unable to attend the event but said in a phone call after the arrests that organizers were told to stay on the sidewalks and abide by laws. However, Lawrence said she was proud of those who marched. "I admired the passion and energy of the allies that came out today to take to the street and remind people what we're fighting for," she said. "... As an individual, I would have been right there with them." However, others who supported the cause were upset with how the event was handled by organizers. They posted to the march's official Facebook page how they believed those who marched in the street detracted from the march's cause and turned the focus away from their message — which was centered around the strength of Supreme Court Justice Ruth Bader Ginsburg. Several of the comments have since been deleted. "I was disappointed with how much this event was fueled by negativity this year," one commenter wrote. "If we are going to use Ruth Bader Ginsburg as a mascot, we should heed her advice regarding change." The post was accompanied by a photo with a quote from Ginsburg: "Fight for the things that you care about, but do it in a way that will lead others to join you." The march, in its third year, is a continuation of the 2017 women's march that took place across the U.S. after the inauguration of Donald Trump. Since, organizers have pushed the event further left to give a more progressive message. "The original marches, they just seemed to be for clout," speaker and organizer Jude Afolake Olubodun said. "Like, 'just let me come out for one day and show that I did this,' and not actually fighting for what we actually need for every other day of the year." Speakers talked largely about abortion rights, race equality, transgender rights and Afolake Olubodun accused Susan B. Anthony of being racist. "Many people think these women stood for what was progressive for all, but in actuality those women fought for the right to vote in exchange for the death of the black women," she said following her speech. "They fought against black people." The arrests left those in attendance emotional, but some were still glad to have attended and stood by their decisions. "There will be no justice until there's equality. That's what this whole this is about. Women are not being treated fairly and our rights, if you can call them that, are not the same as everyone else's — especially for people of color," Chattanooga State Community College student Elizabeth Simmeried said. "Yeah [it was worth it.] Until people know, there is nothing that is going to be done." Updated Jan. 19, 2019 at 4:11 p.m. after the Chattanooga Police Department confirmed five people were arrested and again at 7 p.m. with more information from the police department. A previous version of this article misspelled the last name of Holly Selvwv due to an editing mistake. The Times Free Press regrets the error.